Ulaanbaatar is home to the British Embassy in Mongolia. The embassy can register a birth of a child born abroad and can also register a marriage in Mongolia or a death of a British national. If you are married to a Mongolian you can apply for marriage visa in Mongolia or if you have a British fiancee you can apply for a fiancee visa. You can also apply for a tourist visa while in Mongolia if you wish to visit the UK on holiday. Speak to the staff in Ulaanbaatar for more information. We have listed the timeline for a British Visa in Mongolia. 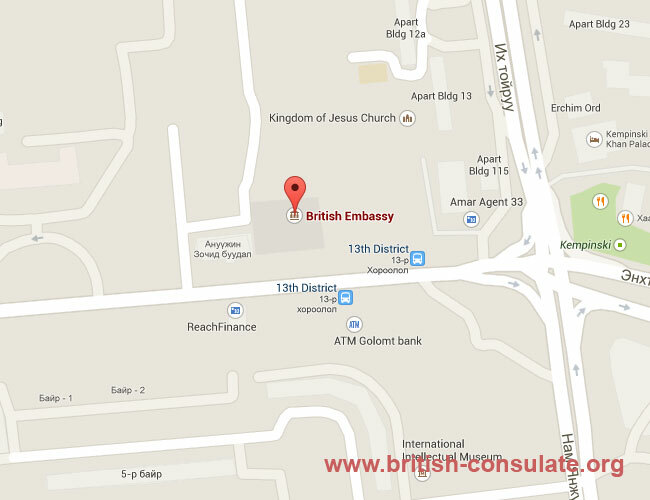 The details such as a map to the embassy, telephone number and email and contact details are listed below.